The slope-intercept form of an equation is y = mx + b, which defines a line. When the line is graphed, m is the slope of the line and b is where the line crosses the y-axis or the y-intercept. You can use slope intercept form to solve for x, y, m, and b. Follow along with these examples to see how to translate linear functions into a graph-friendly format, slope intercept form and how to solve for algebra variables using this type of equation. The primary difference between these two forms is y. In slope-intercept form — unlike standard form —y is isolated. 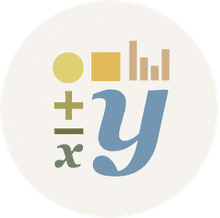 If you're interested in graphing a linear function on paper or with a graphing calculator, you'll quickly learn that an isolated y contributes to a frustration-free math experience. Learn how to solve for y in linear equations with single and multiple step solving. Solve for y, when x + y = 10. 1. Subtract x from both sides of the equal sign. In other words, solve for y. 1. Add 5x to both sides of the equal sign. 1. Rewrite -y as + -1y. 2. Subtract ½x from both sides of the equal sign. 3. Divide everything by -1. Solve for y when 8x + 5y = 40. 1. Subtract 8x from both sides of the equal sign. 2. Rewrite -8x as + - 8x. 3. Divide everything by 5.